The Chrysler bankruptcy had virtually zero impact at the open and the Dow quickly gained a triple digit head of steam. As the day wore on, however, stocks faded and profits were taken. Speculative juices vanished and as Brand Nubian said, Punks Jumped Up To Get Beat Down. 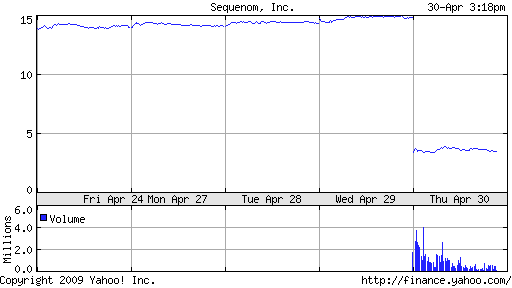 The stock got whacked for 75% on news that it’s prenatal Down Syndrome test will be delayed. Ucchhh! Newell Rubbermaid (NWL), Visa (V) and First Solar (FSLR) were all big winners on their earnings, even if they gave back some in the 3 o’clock hour. Bank of America (BAC) peeked it’s head above 10 on the news that Ken Lewis was out as Chairman, but then the shareholders woke up and remembered that he’s still the CEO, so the rally faded. Thanks to all for reading today. Have a good night. Full Disclosure: I currently manage client accounts that are long V, please do not trade based on anything you read here, see my Terms & Conditions page for a full disclaimer.